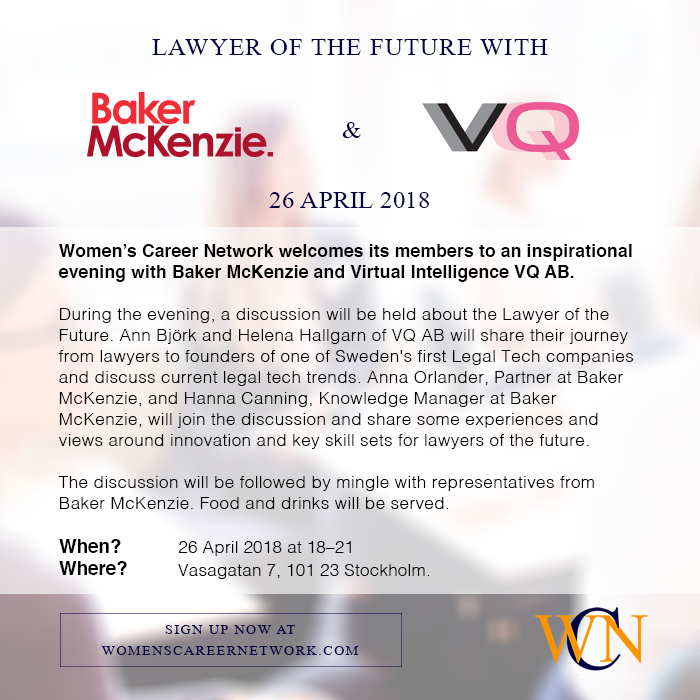 On 26 April, Women’s Career Network welcomes its members to an inspirational evening with Baker McKenzie and Virtual Intelligence VQ AB. During the evening, a discussion will be held about the Lawyer of the Future. Ann Björk and Helena Hallgarn of VQ AB will share their journey from lawyers to founders of one of Sweden’s first Legal Tech companies and discuss current legal tech trends. Anna Orlander, Partner at Baker McKenzie, and Hanna Canning, Knowledge Manager at Baker McKenzie, will join the discussion and share some experiences and views around innovation and key skill sets for lawyers of the future.